Whether you are new to floating down a lazy river or you live for weekend floats with family and friends down the Buffalo, Dirst Canoe has a few day-floats just for you. And for those looking for a true adventure, we also have a few multi-day float trips. Grab your supplies, your gear, and a few friends to start your float on the beautiful Buffalo National River. We have a few standard day floats that fit the schedules of most people. Depending the on the level of the river, the time it takes to float varies. It also depends on how much time you plan on swimming, fishing, or just relaxing on a gravel bar. 4.5 Mile Float - For those who want to experience river floating but you don’t have a lot of time or you have small children, this short and sweet float down the Buffalo River is just what you need. This float starts at Spring Creek and ends about 4.5 miles later at Dillard’s Ferry. You can call it a day after the float or spend a little time exploring. There is a hiking trail nearby and if the water levels permit, you can have a little more fun in the water splashing around. 9 - 9.5 Mile Floats - For those who want to make a full day out of floating the Buffalo River, we have two floats that range between 9 to 9.5-mile floats. The first float is from Dillard’s Ferry to Rush Landing and it is about 9.5 miles. This is perhaps one of the most popular day float trips. During this float, you get to take in some of the most beautiful scenery as bluffs tower above on your float. It’s also considered a great float for those who want to get in a little fishing. Once you get to Rush, you also have a few options. You can go hiking and exploring. Rush is known for its historical ghost town and makes hiking well worth it. You can also choose to camp overnight for a small fee. The next float from Maumee North to Dillard’s Ferry. This 9-mile float is long but easy. As mentioned earlier, when you get to Dillard’s Ferry, you can hike, explore, and have a little fun. The best part is that you can take your time as there is no scheduled pick up time. 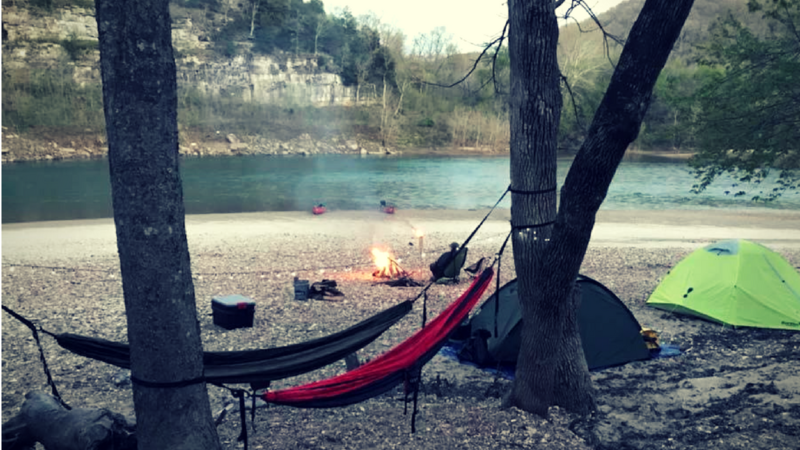 If you want to add a camping to your float down the Buffalo River, there are a few options. 2-Day Float Trip - For those who would like to extend their floating trips and camp, the float from Maumee North to Rush is a great one to take on...even for beginners. There are a few stops about half-way. You can stop at Dillard’s Ferry and take a small break, hike, and relax or if you want to keep going, Buffalo Point is not too much further. At Buffalo Point, you can call it a night and set up camp. This camping area provides showers and electricity. They even have a restaurant nearby during peak season. After a restful night at Buffalo Point, you can take on the Buffalo in your kayak or canoe as you head to Rush. As mentioned earlier, this part of the Buffalo River is one of the most popular stretches. 3-Day Float Trip - Have a three-day weekend lined out? This float would be great for those who really want to get back to basics and into the wilderness. This float starts at Dillard’s Ferry and travels all the way to Ship’s Ferry. With this journey, you need to be a little more prepared, and the last leg of the float may require a bit more skill level as you transition from the Buffalo River to the White River. From Dillard’s Ferry, you spend the day on the river floating up to Rush. Rush is a great place to stop, relax, camp, and explore. 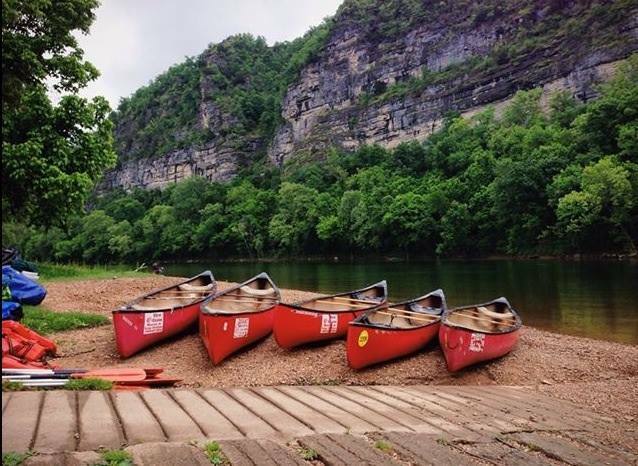 From Rush, you will begin to venture to parts of the Buffalo River that many people do not often canoe. This is known as the Lower Wilderness Area. This is a great area for those who love to fish. Once you have had your day’s worth of floating, find a nice gravel bar to set up your tent. When you get to the White River, you will need to paddle a little more. Head about 6 miles downstream to get to Shipp’s Ferry. People have been choosing Dirst Canoe Rental as their go-to authorized concessioner on the Buffalo National River year after year. Whether you are just trying out this thing called, “floating” or you want a challenge, Dirst Canoe can help you plan your next floating adventure. We offer a few standard float trips, but we are happy to help you customize a different, more adventurous trip. We also love having large groups of families and friends. Give Dirst Canoe a call today at 800-537-2850 or 870-449-6636 to set up and reserve your kayaks and canoes. Already have your own? No problem. Dirst Canoe also offers shuttle service. Give us a call for details.